What happens to a lost glove? Is it picked up and taken home by someone or perhaps swept up destined for landfill? And the remaining un-lost glove, what happened to that? Is it heartlessly discarded, or perhaps relegated to the back of a cupboard or drawer? He liked to scare passers by, it was great fun! But he had to do it alone as his brother was off chasing girls. 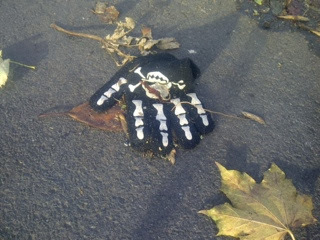 You can now email your lost gloves & mittens photos for inclusion on this site - please send with location and time details where possible to glovesandmittens@live.co.uk, or if you prefer join the Flickr group and add your photos that way - thanks, all contributions will be credited.